Dating and courtship practices have changed over the years. The ritual of man and woman looking for romance is different today from what was the norm before. That is why young people today cannot seem to relate when parents share how they dated during their time. It really has changed that much. And so, to give you some interesting tidbits of knowledge, here are some of the more interesting ways people all over the world dated and courted in the past. Gloves seem to play an important role in the game of romance in the old times. English gentlemen used to send women they fancy meeting with gloves as a gift. If a woman likes the man, she will wear the gloves to church. 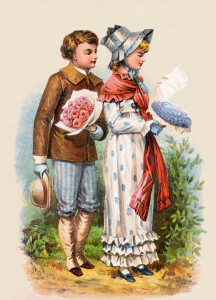 During courtship in Victorian times, men were required to wear gloves. Any kind of touching is considered inappropriate, unless the couple is already engaged. In old Austria, women going to balls usually also bring pieces of apples which they place on their armpits. At the end of the night, the women offers men they fancy the slices of apple already soaked with their body odor. If the gentlemen also fancied her, he will take a bite of the apple slice. It just goes to show how dating and courtship can be weird sometimes. You may consider it as a very formal dance if you are invited to a ball in the Victorian times. The invited women have dance cards where men sign up in the order of who they will be dancing with through the night. It is not good for women to have empty slots on their dance cards. It is also not considered good manners for women to engage in cutting or trying to avoid dancing with men they do not like who signed up on their dance cards. But it happens. Some courtship rituals during the can sometimes be weird as well. During the 16th and 17th Century, there is a popular activity among dating couples called “Bundling”. It allowed couples to hang out together in bed. But it comes with a twist. The couple should be fully clothed and a bundling board is placed between the two beds. This way the couple may be literally in bed but will refrain from touching each other. It surely builds a lot of tension between couples in those days. In the olden days, women may not be as fortunate receiving lavish gifts from rich gentlemen. In the Victorian Era, men who court the women are only allowed to bring flowers, candy or a gift to present to the lady on visiting day. Men are prohibited from giving something more expensive than that. Even the visits have a time limit. The men, aside from wearing gloves to prevent direct physical contact, the courting visit should not last for more than 30 minutes. Someone, it seems, may be taking note of the time of each visit.